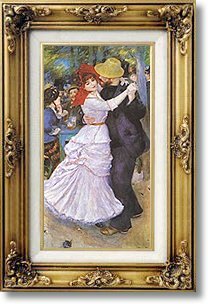 Dance at Bougival by Renoir - no-risk guarantee! This was one of Renoir’s most ambitious and beloved works. It was painted in the studio but captures a delightful, sunny afternoon at Bougival, near Paris. Bougival’s open-air cafés were popular with city dwellers and described as quite select and expensive. The young woman was modeled by Suzanne Valadon, a trapeze artist turned professional model, who later became well known as a painter. Renoir’s friend Paul Auguste Llhote posed as Valadon’s partner. The painting is timeless in the pleasure it conveys but modern in its setting and details.